In Fall 2009, the California State Legislature passed a comprehensive package reforming governance of the Sacramento-San Joaquin Delta (Delta) and related aspects of statewide water management. 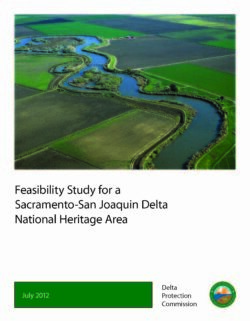 This feasibility study has been undertaken in order to fulfill this legislative mandate, which upon acceptance of this study by the DPC, it will be submitted to a Delta Congressional Representative to introduce legislation to establish a Delta National Heritage Area (NHA). The study inventories and describes resources of the region which are supportive of the proposed NHA’s story and themes that make the area a place of national significance. The study also proposes how the NHA will be managed and organized to coordinate heritage area activities. Additionally, local groups who support the NHA are listed, along with letters of support; and organizations who are interested in potentially serving as partners on NHA activities are described, along with letters of partnership commitment. During the course of this process a separate effort was initiated to establish a Delta NHA. In January 2011, Senator Dianne Feinstein introduced legislation into the Senate, with companion legislation introduced by Congressman John Garamendi into the House of Representatives to designate a Delta NHA, with the DPC as the management entity. The DPC has been monitoring the progress of this legislation while continuing to work on this feasibility study. A NHA is a place designated by the United States Congress where natural, cultural, historical and recreational resources combine to form a cohesive, nationally-distinctive landscape arising from patterns of human activity shaped by geography. These areas tell nationally important stories about our nation and are representative of the national experience through both the physical features that remain and the traditions that have evolved within them. The DPC developed this study with a process that incorporated public involvement throughout its entirety. A variety of activities were undertaken to acquire stakeholder input, including: public meetings, public presentations, stakeholder interviews, public review memos, and project study team meetings.